This article by Robert Loerzel originally appeared in Pioneer Press on February 10, 2005. An old wheel cover from a Plymouth once sat on the shelves of a store in Libertyville, but now it’s the hubcap heard ’round the world. 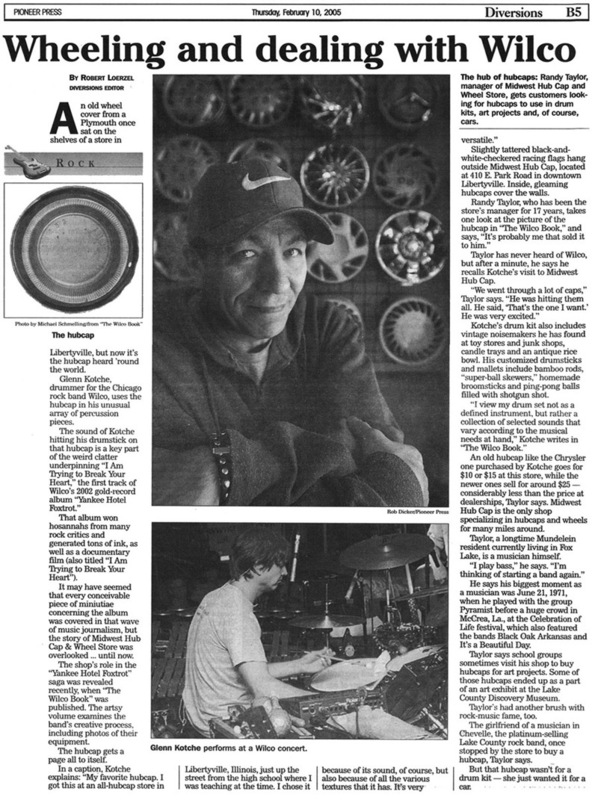 Glenn Kotche, drummer for the Chicago rock band Wilco, uses the hubcap in his unusual array of percussion pieces. That album won hosannahs from many rock critics and generated tons of ink, as well as a documentary film (also titled “I Am Trying to Break Your Heart”). It may have seemed that every conceivable piece of minutiae concerning the album was covered in that wave of music journalism, but the story of Midwest Hub Cap & Wheel Store was overlooked … until now. The shop’s role in the “Yankee Hotel Foxtrot” saga was revealed recently, when “The Wilco Book” was published. The artsy volume examines the band’s creative process, including photos of their equipment. The hubcap gets a page all to itself. Slightly tattered black-and-white-checkered racing flags hang outside Midwest Hub Cap, located at 410 E. Park Road in downtown Libertyville. Inside, gleaming hubcaps cover the walls. Taylor has never heard of Wilco, but after a minute, he says he recalls Kotche’s visit to Midwest Hub Cap. Kotche’s drum kit also includes vintage noisemakers he has found at toy stores and junk shops, candle trays and an antique rice bowl. His customized drumsticks and mallets include bamboo rods, “super-ball skewers,” homemade broomsticks and ping-pong balls ruled with shotgun shot. An old hubcap like the Chrysler one purchased by Kotche goes for $10 or $15 at this store, while the newer ones sell for around $25 — considerably less than the price at dealerships, Taylor says. Midwest Hub Cap is the only shop specializing in hubcaps and wheels for many miles around. Taylor, a longtime Mundelein resident currently living in Fox Lake, is a musician himself. He says his biggest moment as a musician was June 21, 1971, when he played with the group Pyramist before a huge crowd in McCrea, La., at the Celebration of Life festival, which also featured the bands Black Oak Arkansas and It’s a Beautiful Day. Taylor says school groups sometimes visit his shop to buy hubcaps for art projects. Some of those hubcaps ended up as a part of an art exhibit at the Lake County Discovery Museum. Taylor’s had another brush with rock-music fame, too. The girlfriend of a musician in Chevelle, the platinum-selling Lake County rock band, once stopped by the store to buy a hubcap, Taylor says. But that hubcap wasn’t for a drum kit — she just wanted it for a car.